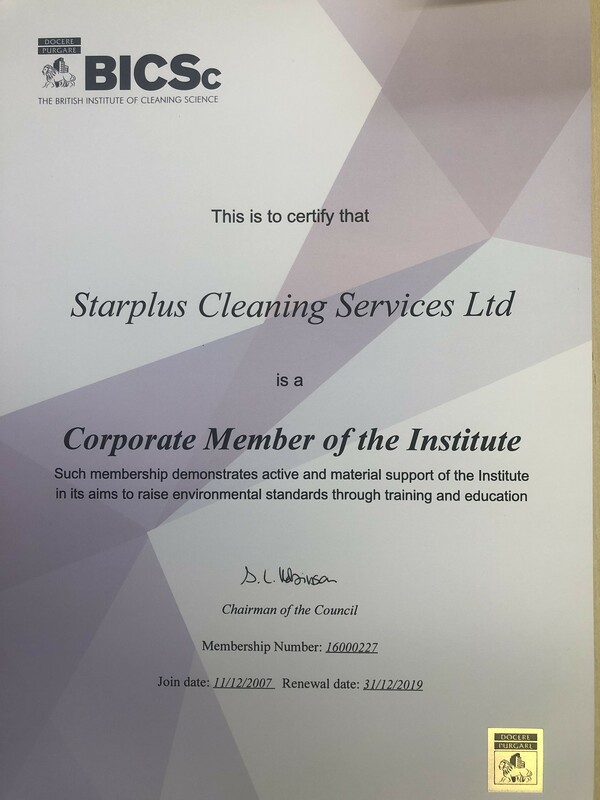 StarPlus Cleaning Services Ltd is a Corporate Member of The British Institute of Cleaning Science Since 2007, founded in 1961, is a body of individuals and companies who support the objectives of the institute in improving opportunities for education, training and qualifications within the cleaning industry. Through the achievement of these objectives the institute seeks to achieve better recognition and status for the cleaning industry and a raising of standards. Companies wishing to join as Corporate Members are required to have been trading for a reasonable period, to provide a sponsoring corporate member and give certain undertakings, which include conforming to the Institute’s Code of Practice.There are 4000 individual members and of the 8630 registered cleaning companies in the UK only 575 have been accepted as corporate members. Companies who become corporate members are showing their commitment to these aims, their enthusiasm and support for the Institute and their wish to observe the Institute Code of Practice. StarPlus Cleaning Services Ltd is one of the successful companies that join a leading edge scheme, designed to help industry improve its safety record. 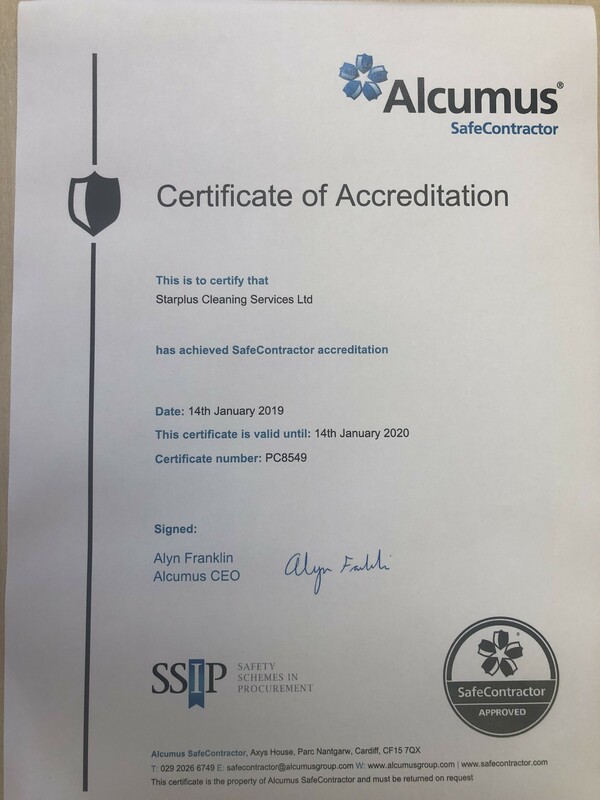 We received accreditation since 2007 from SAFEcontractor every year, a programme that recognises very high standards of health and safety practise amongst UK contractors. Safe contractor accreditation is expected to enhance our Company’s ability to attract new contracts. SAFEcontractor is operated by international safety health and environmental risk management specialists, the National Britannia Group. The system is applicable to most sectors although it is particularly relevant to food manufacture, property, facilities management, retail and leisure sectors, all of which are big users of contract services. Those companies meeting the high standard are included on a database, which is accessible to registered users only via a website, www.safecontractor.com. Employers in turn agree that, as users of the scheme, they will engage only those who have achieved accreditation. CHAS (Construction Health and Safety scheme) accredited! CHAS is a health and safety accreditation scheme for contractors and subcontractors in the construction industry, and often acts as a type of pre-qualification during the tender process. For instance, if a particular contractor were seeking competent Builders cleaners, one of their criteria for potential cleaning suppliers might be CHAS accreditation as this would fill them with the confidence of knowing that the company are serious and professional as they could not have achieved CHAS without having first demonstrated high standards of work and health and safety compliance. Some contractors require CHAS to be gained before they allow companies to tender, and this is being seen more often in public procurements such as for councils, schools and other public sector bodies. The purpose of CHAS is to help both buyers and suppliers in the assessment of health and safety competence. Helping buyers by reducing the lengthy process of assessing contractors health and safety standards individually. Helping suppliers (contractors) by reducing the time consuming process on completing and submitting full details of health and safety processes on each project they compete for. With our CHAS accreditation and with our SafeContractor Acreditation we commit to annual assessments to show that we are maintaining the high levels of health and safety management required.